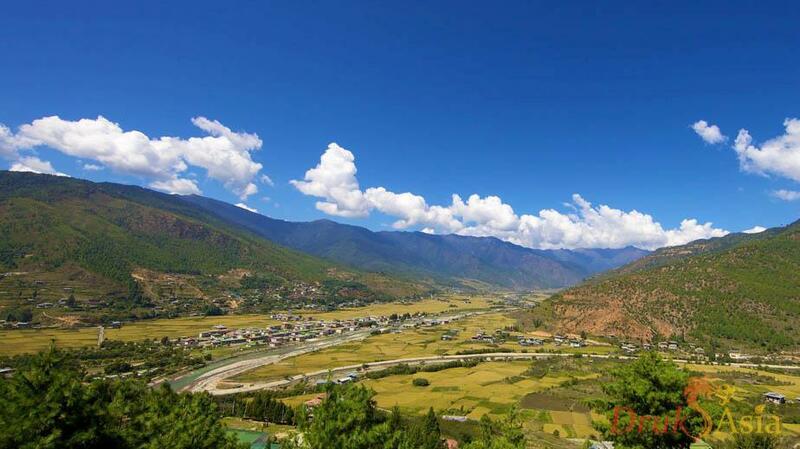 Bhutan through Samdrup Jongkhar will take you to Trashigang, and from there over the lateral route to Mongar, Bumthang, Trongsa, Wangdue Phodrang and then finally into the capital, Thimphu. Hanumaan Temple - Hanumaan Temple is a hindu temple with around 50 kms of area for the entire compound. It is in this temple that Hanumaan Jayanti is celebrated with much fanfare by both Bhutanese and Indian people. Samdrup is also one of the destinations where one can try all sort of Bhutanese, Continental and Indian cuisine. One can try these dishes at any of the restaurants around. We will set off early from Samdrup Jongkhar to Trashigang. Kanglung Zangdopelri Lhakhang - A 22 kilometres drive on the highway that connects Trashigang with Samdrup Jongkhar will take you to Kanglung where one can visit the Zangdopelri lhakhang. Khaling Handloom - Khaling National Handloom (Weaving Centre) is located at Khaling on Trashigang - Samdrupjongkhar highway. One can visit this handloom and learn & experiences the weaving culture of eastern Bhutan. Chorten Kora - This dazzling white stupa is situated on the riverbank below the town. Constructed in 1740 by Lama Ngawang Loday, it is built in the same style as Bodnath Stupa in Nepal, with eyes painted at the four cardinal points. TrashiYangtse Dzong - Trashiyangtse Dzong is one of the oldest Dzong in Bhutan with a history dating back to the 9th century. It was previously known as Dongdi Dzong. Gonkar Gyal, grandson of lhasey Tshangma, who had established himself in Tshenkharla, built Dongdi Dzong. Gom Kora - 24 km from Trashigang, the temple of Gom Kora is set on a small alluvial plateau overlooking the Dangmechu river. Dramitse Lhakhang - One of the most notable religious sites is the Dramitse Lhakhang built in the 16th century by Ani Cheten Zangmo, the daughter of the renowned terton Pema Lingpa. The Dramitse Ngacham or the “Dance of the Drums of Dramitse,” was born in this Lhakhang in the 16th century. Today, it is a popular dance performed at all major festivals. It is also on the esteemed UNESCO World Heritage list. Mongar Dzong - Although built in the 1930s and one of Bhutan’s newest Dzongs, it is constructed in the same way as all earlier Dzongs, without plans or nails. However, unlike the earlier Dzongs, which are located in strategic positions, Mongar Dzong is located on a small gentle slope area just above the town. A visit to Mongar Dzong shows one how traditional Bhutanese architecture has continued to thrive through the centuries. Trashigang Dzong - Built in 1659, on a spur overlooking the Dangmechu river, Trashigang Dzong or the fortress of the auspicious hill has been the political stronghold of eastern Bhutan for over 300 years. The Landscape on which the Dzong stands is not only picturesque but arouses curiosity. Guru Nangsey Zilneon in Takila, Lhuentse - The 154-ft tall statue is seated on a 38-ft high lotus-base on a hill in Takila, overlooking Tangmachu village in Menbi gewog. Lhuentse Dzong - This mighty fortress, popularly known as Lhundub Rinchentse sits upon a hill overlooking the Kurichu River. Khoma Village - This small village is situated about two hours walk from Lhuntse Dzong, through gentle slopes carpeted with pine trees. This village is known throughout the country for its production of Kishuthara, an extremely intricately patterned silk textile. The women of Khoma work in makeshift textile cottages, weaving delicate designs and patterns. Producing and selling Kishuthara has become the primary occupation of many of the villagers, and it will be much cheaper to acquire some of this beautiful material here than in the handicraft shops in the capital. Bumthang is one of the most spectacular valleys in Bhutan and also the heartland of Buddhism in Bhutan. It is an area with a wide variety of fauna and flora. The Guru Rinpoche and his lineage of Tertons (treasure finders) making Bumthang his home has led to more than 40 temples being built in this peaceful valley. Ura Valley - Enjoy an excursion to Ura valley that will be around four hours driving back and forth. The drive is exciting as it passes through some sheep rearing farms. Serthang-La pass at 3600m above sea level offers a great view of Gangkar Puensum (the highest unclimbed mountain in the Himalayas). Jambay Lhakhang - This 7th-century monastery was one of 108 monasteries built in 659 by Tibetan King Sontsen Gampo to subdue evil spirits in the Himalayan region. Kenchosum Lhakhang - Kenchosum Lhakhang is a rural looking temple which has its roots in the 7th century. Kurjey Lhakhang - One of the most sacred monasteries in Bhutan. Nabji Lhakhang - Nabji Lhakhang’s name means “taking an oath.” Long ago in this location, King Sindha and King Nawoche took an oath of non-violence against each other in the presence of the great Indian guru, Padmasambhava (Guru Rinpoche). Chendebji Chorten - 2 kilometres beyond Chendebji village is Chendebji Chorten, at a lovel0y spot by a river confluence. The large white chorten is patterned after Swayambhunath in Kathmandu and was built in the 19th century by Lama Shida, to cover the remains of an evil spirit that were killed. Trongsa Museum (Taa Dzong) - Sits high above the valley at a strategic vantage point over Trongsa Dzong. The "Tower of Trongsa" tells the stories of the dzong and the valley that it has watched over for centuries. His Majesty the King inaugurates the Taa Dzong as a museum dedicated to the Wangchuk dynasty, landmarking yet another significant event as the nation celebrates 100 years of the monarchy. Black-Necked Crane Information Centre - The valley of Phobjikha is known as the winter home of the Black-necked Crane (Grus Nigricollis). Bhutan is home to around six hundred black-necked cranes with Phobjikha being one of the popular places that the birds migrate to in the winter months from the Tibetan plateau. The elegant and shy birds can be observed from early November to an end of March. Gangtey Goempa - Situated south of the road and east of Wangdue Phodrang, is Gangtey Gompa, an old monastery dating back to the 17th century. The largest Nyingma monastery in western Bhutan, it was founded in 1613 by Gyalse Pema Thinlay. Phobjikha Valley- Well known as the winter home of the Black-necked Crane (Grus Nigricollis). Bhutan is home to around six hundred black-necked cranes with Phobjikha being one of the popular places that the birds migrate to in the winter months from the Tibetan plateau. The elegant and shy birds can be observed from early November to an end of March. Overlooking the Phobjikha valley is the Gangtey Goempa. This is an old monastery that dates back to 17th century. Punakha Dzong - Placed strategically at the junction of the Pho Chu and Mo Chu rivers, the Dzong was built in 1637 by Zhabdrung Ngawang Namgyal to serve as the religious and administrative seat of the region. Pho Chhu Suspension Bridge - The 160 metres Pho Chhu Suspension Bridge is known for the longest suspension bridge in Bhutan, which gives you spectacular views of Punakha Dzong and the Pho Chhu Valley. Dochula Pass - At 3,050 meter, this beautiful pass located on the way to Punakha from Thimphu offers a stunning 360-degree panoramic view of Himalayas mountain range with its 108 chortens that was built by Her Majesty The Queen Mother Ashi Dorji Wangmo Wangchuck. The pass is also a popular spiritual destination for both locals and tourists. Buddha Point - Located at Kuenselphodrang Nature Park, the 169 feet bronze statue of Buddha Dordenma, Vajra Throne Buddha makes it one of the largest statue of Buddha in the world. National Memorial Chorten - Meet the elderly generation in circumambulation at the National Memorial Chorten. Chorten means ‘Seat of Faith’ and Buddhists often call such monuments, the ‘Mind of Buddha’. Simtokha Dzong - Five miles from Thimphu, on a lofty ridge, stroll through the very first dzong, built in 1627 by Shabdrung Ngawang Namgyal. Changangkha Monastery - Built in the 12th century, Changangkha Lhakhang is the oldest temple in Thimphu. Simply Bhutan- A living museum and a photo studio with a mission to engage and empower youth entrepreneurs through the preservation, promotion and showcasing of Bhutanese tradition and cultural diversity. Tachog Lhakhang - In the 14th century an emanation of Guru Padmasambhava, the great Siddha Thangtong Gyalpo had been to many places and built about 50 iron bridges in the parts of this world, for the benefit of all beings. Paro Dzong (aka Ringpung Dzong) - Explore the Rinpung Dzong, which the locals call the ‘fortress of a heap jewels’. Built in 1646 by Zhabdrung Ngawang Namgyal, the dzong stands on a hill above Paro Township. National Museum (Ta Dzong) - On a ridge immediately above Rinpung Dzong is Ta Dzong, originally built as a watchtower. Paro Valley - The beautiful valley is home to many of Bhutan's old monasteries and temples. The valley is also home to Mount Chomolhari (7,300 meters) situated at the northern end of the valley whose glacier water forms the Pachu flowing through the valley. Paro Town- Explore the main street of Paro town and check out if there's anything you will like to pick up as a souvenir! Today we will bid fond farewell to this beautiful Himalayan country. We hope by now you would have made some friends and also kept many photos and beautiful memories of Bhutan! And we look forward to seeing you again in this beautiful land of endless Enchantments! Tashi Delek!